Milan 2016: design for children is emerging as one of the hot trends at this year's Milan design week, as designers and brands cotton on to the vast potential of the kids' furniture market. Child-focused furniture and toys have dominated the previews ahead of Milan's annual festival of design, which officially kicks off tomorrow. Among those to spot a gap in the market is Italian brand Kartell, which is launching an entire new range of products for younger users at the Salone del Mobile furniture fair. "It is a huge market with very high potential, and many offers in terms of furnishings and toys," Kartell president and CEO Claudio Luti told Dezeen ahead of the event. 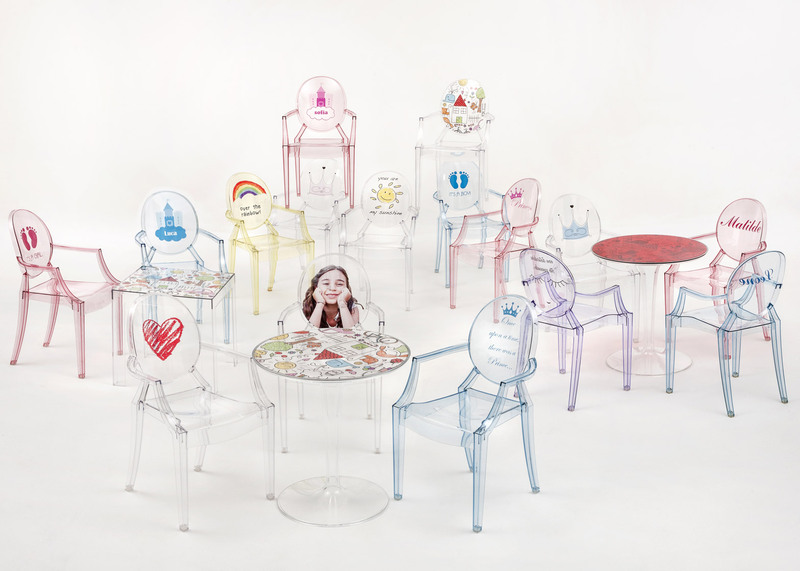 Kartell has enlisted designers from its repertoire to create children's furniture that is consistent with the brand's current range. These include a minimal transparent rocking horse by Nendo, a swing by Philippe Starck and a set of plastic vehicles by Piero Lissoni. The aim is to entice existing customers, as well as making new fans from a young age. "This is a very transversal proposal, ideal for parents and relatives, but even kids themselves could ask to have these products," said Luti. "Maybe asking Santa Claus to bring them under the Christmas tree!" "A kid that falls in love with a design product today will probably grow 'Kartell-hearted' in the future," he added. Swiss studio Big-Game is also debuting a child-focused design for Italian brand Magis' established Me Too range, which already features a bunk bed and a rocking horse by Marc Newson, and the iconic Puppy seat by Eero Aarnio. Although designed for kids, Big-Game's adjustable Little Big Chair is as much aimed at parents. "Adults are the ones buying toys, so they're the ones choosing – often projecting a lot of their own aspirations into the the toys they buy," co-founder Augustin Scott de Martinville told Dezeen. Dutch designer Marcel Wanders has taken a similar approach with his new range for children's brand Cybex, which also launched a collection of winged prams by Jeremy Scott last year. Instead of bright colours usually associated with children's furniture, Wanders' set of high-chairs features black leather upholstery and detailed embroidery, designed as "parent objects" that will blend into the home. "Objects for kids are really smart and really safe, but they are also all pretty much ugly," Wanders told Dezeen. "One of the reasons that they are so ugly is because they are designed with the idea that they are for kids." "You don't have to have a trashed house, you can still have nice things," he added. "I think it is nice to design the house with parents in mind, not the kid in mind." Swedish studio Front, which has created a bent-wood rocking horse for Gebrüder Thonet Vienna, believes that homeowners are becoming more aware of the appearance of their children's toys, as open-plan living puts the items on display. "Today the activities in the home don't have the same divisions between the room as before," Front co-founder Anna Lindgren told Dezeen. "Children's toys are part of the home just as much." She also thinks that today's customers are willing to invest in higher-quality items for their kids. "Today children tend to have so many toys many of which are in poor materials and quality," said Lindgren. "We think people are looking for toys that are more durable. It is fun to be able to buy something that lasts and be able to keep in the family for generations." Scott de Martinville said that creating products for such a specific audience has a few challenges, and listed designing to the right proportions and receiving constructive feedback about comfort among the difficulties. Another problem, he said, is getting kids excited about using and playing with objects other than digital devices. "The main issue today is probably how physical toys can compete with smartphones," said Scott de Martinville. To spark attention from the younger generation, Kartell's range features customisable options so children can chose to decorate the plastic pieces with their favourite photographs or drawings. "Children can also be very severe judges," added Luti. "So you need to properly think what could attract them (and their friends, their fathers, mothers or relatives too)."